LOVE's Haven: Looking for Pro Painters! I haven’t mentioned yet that we have just moved to our new church building last Sunday. Thanks God that we can be able to celebrate and give praise to our God in a place where we can call it our own. Although it’s not yet finish but it is already usable, the only thing that is lacking is the painting of the whole building. The church is still on the process of raising pledges and asking for God’s provision for the paints needed as well as the air conditioners. God-willing, I know that if this time would come surely the church would hire some painters to do it. If so, it would be so nice if we could find some like of the Salem Painter here in our place. I guess finding a professional painter to handle the job would be a better option and really a safer one since they will be dealing with ladders and high places. Besides, painters like them can be certain that they have all the proper equipment to complete the job quickly and safely. Truly, anyone can claim to be a painter, but painting takes a certain amount of detailed skill so when you decide to hire someone for the job you need to become an informed consumer. 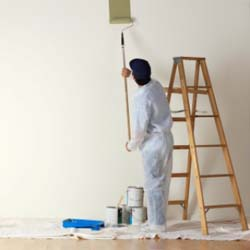 No matter the size of the job, you need to feel assured that you’re hiring the best painter for your specific job.